Previous article Where to eat vegan food in Chiang Mai! This blog post is a Chiang Mai Elephant Land Review. There are so many Elephant sanctuaries in Chiang Mai that all promote themselves with the promise of caring for their elephants and treating them well. However, this is not the case. Sadly many of the elephant sanctuaries still offer elephant riding, keep the elephants in chains and treat their elephants badly. Because all the elephant sanctuaries promote themselves in the same way, it can be difficult to know which ones actually care for their elephants. We went on a two-day hike to the jungle with Chiang Mai Elephant Land, who genuinely protects and care for their beautiful elephants. We cannot recommend them enough. 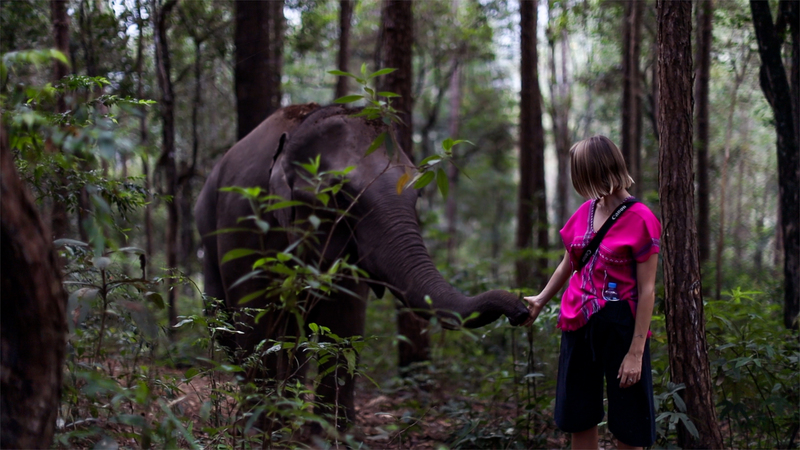 The best part of this jungle adventure was to experience how Chiang Mai Elephant Land treated their elephants. There was no elephant riding, no chained animals and no sticks to poke the elephants. The elephant crew communicated with the elephants only by using their voice and giving them treats. You could tell that they truly cared for the big animals and were very protective of them. Numerous times the crew told of tourists who stood on the elephants’ food, touched them a ticklish place or moved to suddenly around the elephants. We really respect the work they are doing and think they gave us an unforgettable experience of the jungle life with elephants. The first morning Chiang Mai Elephant Land picked us up and drove us two hours south and into the jungle. And by jungle we mean jungle. If our car didn’t have four-wheel drive, we wouldn’t have made it. We arrived at a small village consisting of four bamboo huts without electricity and flush toilets. Three cute puppies welcomed us and we immediately spotted five huge elephants. They were standing quietly and well behaved and chewed on some grass and they weren’t chained. We were served fruit, coffee, and tea while our sweet guide informed us about the days’ schedule. On the first day, we started out by feeding the elephants sugarcane and got familiar with them. We went on a two-hour trek in the jungle with the elephants. Hereafter we ate lunch, which was really good and suited for vegetarians! Then we went for a mud bath with the elephants and walked to a waterfall to rinse off the mud. We were served fruit, coffee, and tea again. After this refreshment, the people who only booked a one-day tour were picked up and driven home to Chiang Mai again. We were only four that stayed for the night and we became friends very quickly – backpacker style. We had a guide that stayed with us, but the first hours we were actually left pretty much on our own, which was great. We explored the place, took another dip in the waterfall, had a Chang beer, got to know each other and played with the puppies. We joined our guide to see how he cooked dinner in one of the primitive bamboo huts and he explained about how life was in the huts. The dinner was great, and afterwards the guide and two other guys from the village made a campfire and taught us native elephant songs. It was the most incredible and fun experience to sing and dance to songs about elephants in Thai language and hear all kinds of tales about life in the jungle. We were accommodated in our own bamboo hut, which had sleeping bags and extra duvets to keep us warm through the night. Our guide served us breakfast outside our hut, and when we were done, we showered in the waterfall. So refreshing! We said good morning to the elephants and began another hike to gather medicine for the elephants. We got to taste all kinds of different eatable plants in the jungle and were told of all their positive effects. After some hours of walking, pointing out wild animals and exploring the jungle, our guide prepared us lunch jungle-style in a bamboo hut in the middle of the jungle. Such a great experience! Mid-day we returned to the elephant village, where we fed the elephants with the jungle medicine that we collected and took a last refreshing shower in the waterfall. Simply put: we had the best jungle day you can imagine. to do a two-day hike with Chiang Mai Elephant Land if you genuinely want to experience the primitive jungle life, jungle culture and to be around elephants, which you know are treated well. If you are seeking a shorter and less demanding experience, you can also do the one-day hike. However, you need to know that it is a less authentic experience with more tourists. It is still an amazing tour though!